WARSAW, Poland -- The Obama administration has already started crunching numbers to determine how much the U.S. can slash greenhouse gas emissions after 2020, State Department Special Envoy for Climate Change Todd Stern said today. Speaking at the opening of the second week of U.N. climate change negotiations, Stern said the administration wants to see a new global agreement emerge in 2015. By early that year, he said, countries including the U.S. should be able to put new emissions pledges on the table. "I don't have any doubt that we will be ready to do something by that time," Stern said. Meanwhile, a mood as bleak as the gray sky in the Polish capital has descended on the annual talks here as rich and poor countries remain at loggerheads over money for vulnerable countries and near-term ambition to avoid the worst impacts of global warming. Fights over those issues, activists say, are blocking work on the new climate pact that is supposed to be signed in 2015. That deal, if the Obama administration has its way, will for the first time make the U.S. and emerging powers like China equally obligated to curb carbon. 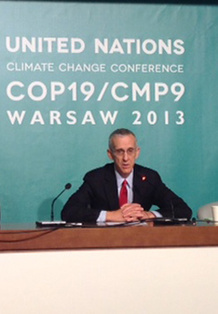 U.S. Special Envoy for Climate Change Todd Stern says the Obama administration already is studying its post-2020 greenhouse gas emissions pledge. Photo by Lisa Friedman. It's expected to go into effect by 2020, but diplomats still must hammer out dozens of issues -- not the least of which will be how far in the future new emissions pledges will travel and how to ensure they add up to a level that keeps global average temperatures from rising to dangerous levels. "We're used to arriving at the first week of the [Conference of the Parties] with some problems on the table but some progress on technical issues," said Ruth Davis, chief policy adviser to Greenpeace U.K. This year, she said, "I'm struggling to see where that progress is going to be made and what the shape of the deal is going to look like." With the new Australian government taking a hard line against climate policies here, Japan announcing it will downgrade its plans to reduce emissions and no firm plan in sight for mobilizing a long-promised $100 billion in annual climate aid, activists said they must start seeing a change in wealthy country actions before talk begins in earnest about 2015. "I don't think we can leave this conference without some predictability on finance and the road map to the $100 billion," said Liz Gallagher, a senior policy adviser at the U.K. think tank E3G. "I don't see how we get a deal unless we get that." At the same time, countries did emerge today with a draft plan for hammering out a 2015 deal, laying out the array of issues that must be addressed. U.N. climate chief Christiana Figueres said she expects diplomats will be able to adopt a decision that "puts forward steps, structure and logic" toward a new agreement by the end of the Warsaw conference. Stern today quashed any possibility the U.S. would announce new funding or a pledge toward the $100 billion in funding, much of which wealthy nations hope will be funded by the private sector. He said he expects that once new rules are established around the Green Climate Fund, through which most climate dollars are expected to flow, it will "pave the way for countries to start initial capitalization." Meanwhile, Stern said, "We have come to Warsaw with the intent to help build momentum with the objective of an agreement in Paris in 2015." He said the U.S. plan -- which involves countries pledging targets rather than formulaically carving up the world's carbon space -- is seeing "more convergence" than any other issue at the talks. "It's not like everybody thinks nationally determined commitments is the most lovely picture on the wall. It's just the most feasible to get an ambitious result," he said. Currently, the U.S. has promised to reduce emissions 17 percent below 2005 levels by the end of this decade, a target officials say they are hitting in part because of a rise in natural gas and an ailing economy, as well as new Obama administration policies. Going forward, Stern said the White House has an interest in determining the new pledge, and the administration already is involved in an interagency process "to think about and develop a post-2020 commitment." Yet whether that number will be based on the assumption that Congress will act to cut America's emissions or on the domestic authority Obama currently is using to rein in power plant emissions is something Stern did not specify. "The degree to which that is based on the kind of projection of policy that's out now, the degree to which you think about or leave some room for new policy that might come into play, that's part of the art of doing that kind of exercise," he said. "I really can't say exactly how that's going to break down. Stay tuned." The federal agencies that will have the task of finding those post-2020 emissions savings were represented in a separate event today, held upstairs at the U.S. delegation's pavilion. Senior officials from the White House, U.S. EPA and the Department of Energy briefed Conference of the Parties attendees virtually or in person on the president's Climate Action Plan, touting it as the way the world's largest historical emitter will deliver on its Copenhagen, Denmark, pledge to cut emissions by 2020. The president also pledged at the talks in 2009 that his country would reduce heat-trapping emissions by 83 percent by midcentury. Asked how the United States would find additional carbon savings after the end of this decade that might allow it to promise more reductions, EPA Deputy Administrator Bob Perciasepe said Obama's plan would continue to bend the emissions curve downward beyond 2020. EPA policies to improve energy efficiency in vehicles and power plants, in particular, would continue to yield dividends as older, less efficient models are retired and replaced by new ones, said Perciasepe, who joined the briefing via videoconference. "When we're done with phasing in the automobile efficiency standards, you still have a fleet turnover that's going to go on for another decade," he said. "So you have a built-in downward trajectory of fuel consumption by the American automobile. And that's going to create a good foundation for us going forward beyond 2020." EPA is working toward a proposal for existing power plant greenhouse gas emissions, which is due to be released in June. Perciasepe said he was "confident" that the draft will be on time and said it would yield ongoing carbon savings for years to come. The deputy administrator said EPA is soliciting stakeholders' input on the existing power plant guidance just as it did when crafting a 2009 deal on tailpipe emissions, and he hoped for a similar degree of buy-in from affected communities. The proposal will draw carbon savings from emissions controls and energy efficiency, he said. "Shifting our fuel mix, going to more renewables and reducing demand are all going to be part of the mix," he said, adding that states would take the lead on crafting implementation plans. White House Council on Environmental Quality Chairwoman Nancy Sutley agreed that the plan would continue to draw down emissions, but she said significant post-2020 reductions would depend on action from Congress. "The Climate Action Plan only delivers on things we know we can do today to reduce greenhouse gas emissions," she noted. "The president has said repeatedly that he is willing to work with Congress on putting steps in place to reduce greenhouse gas emissions, so we'll continue to work on that." But recent efforts to pass comprehensive climate change legislation have been stymied by partisan gridlock and deep political divisions on the issue. Secretary of State John Kerry, the former Massachusetts Democratic senator who in 2010 spearheaded the last unsuccessful bid for a climate change bill, sent a video message to the briefing. He promised that "the United States is absolutely committed to doing our part." Sutley focused her prepared remarks on the federal government's bid to boost communities' resilience to extreme weather events -- an aspect of the plan that her office has taken the lead on while former White House climate change adviser Heather Zichal led efforts on carbon mitigation. Jonathan Pershing, DOE deputy assistant secretary for climate change policy and technology, touted his agency's efforts to support research and development, appliance efficiency, and other policies that he said would continue to draw down emissions. Speaking at his first Conference of the Parties since stepping down as the United States' No. 2 climate negotiator earlier this year, Pershing said DOE is also focused on ensuring that efforts to reduce the carbon intensity of the grid do not make it less reliable. "We want to reduce our emissions -- that footprint is critical -- but we want to do so at the same time that we preserve the viability of the system," he said. "None of us are seeking to shut the lights off as we're working to reduce the footprint." DOE will have a leading role in improving grid efficiency and allowing it to take better advantage of low-carbon, intermittent energy technologies like wind and solar energy, he said. Speaking earlier this month at a carbon capture and storage event in Washington, D.C., Pershing said he was happy to leave the abstract world of U.N. climate change negotiations for the more "tangible" policy issues he now works on at DOE. Asked what he expects from the latest round of talks, the former deputy special envoy said Warsaw would be "another step in the process toward Paris." "It's not a be-all-end-all meeting," he said. "It's part of an ongoing exercise to see where people are, to see what's being developed." Participants hope the talks chart a path toward a legally binding agreement on emissions, which will be negotiated in 2015 to take effect by 2020. Questions to be resolved before the conference ends this week include how and when countries will release their post-2020 emissions-reduction pledges and how those offers will be reviewed.